Synopsis: The Doctor in the wild west! The Doctor has a toothache, and ends up finding Doc Holiday. I remember this serial being horrible, mostly because of the terrible “American” accents. The Doctor sees Doc Holiday, for his toothache, doesn’t seem to realize that dental work in the 19th century is far from ideal. 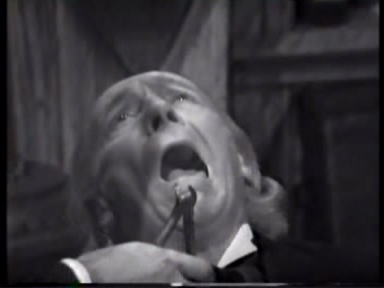 Why he doesn’t pop into the TARDIS and head off somewhere new where perhaps they have better dental work is beyond me. I don’t understand the appeal of Westerns that seemed to be so prevalent in the 1960s. It was a time of lawlessness. It was post-pioneer, but pre-civility. All the sci-fi shows of the time seemed to have a fascination with the Old West. “Nothing can convince me to raise a gun in anger,” says The Doctor, and it’s true. He tends to leave the gunslinging to his companions. It’s rather ridiculous this episode, beyond the silly theme of putting them in a terrible western, they decided that between every scene there had to be a verse of a horrible song. It kills the flow of the episode and makes it tedious to watch. Serial 026, The Savages, is missing. It was the first serial to feature a serial-wide title. Before this, all these titles have been made up by fans or the BBC.